Happy New Year!!! I’m planning on making 2013 the best year yet!! We have a lot of plans for our family, our home, and this blog. I’m excited to see what’s to come! This New Year’s Eve we spent at home with the kids. We rolled in the New Year with homemade noisemakers and pots and pans, dancing and singing. The kids stayed up, even the little ones, and I cooked my way into the New Year. Would you expect anything less? 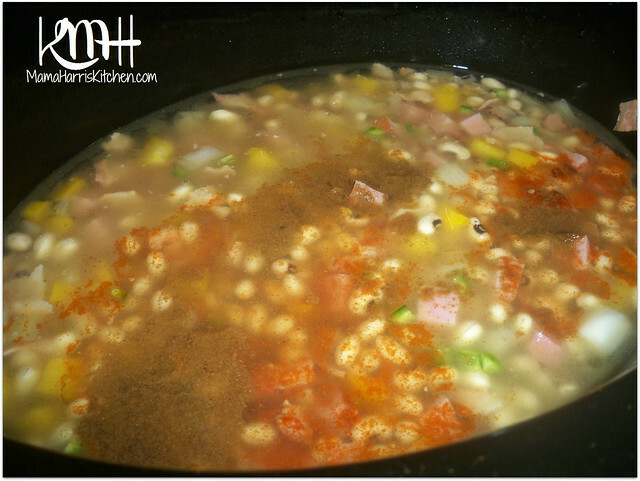 All evening this slow cooked black eyed pea soup was cooking away, and we were all looking forward to our new tradition of eating lucky foods upon the arrival of the New Year. We started this tradition last New Year’s, and while nothing is perfect we definitely had a better year than years past. So we decided to continue it, and see how our “luck” turns out! I’m a born and bred California girl, and my husband is Midwest born, but California raised. 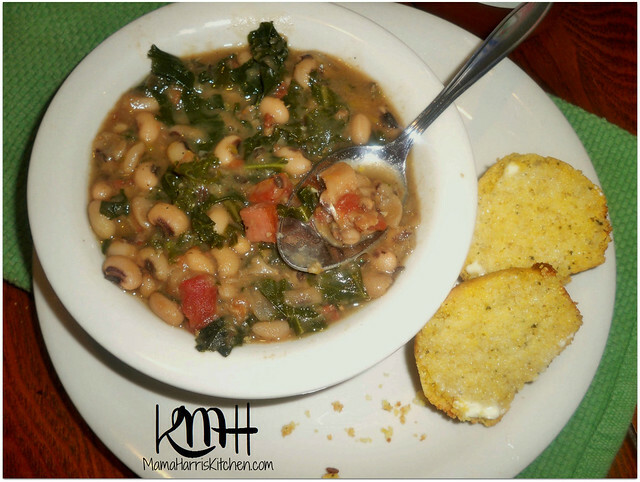 We both have deep roots both in the Midwest and Southern states and we love some Southern cooking. If you’ve been reading up on here for a while now, I’m sure you’ve seen that influence. The New Year’s Day “lucky” foods is no exception. Pork is considered lucky, because when the pig eats he “roots forward” which would signify progress. The pig is typically portly, which means abundance. Fish are also lucky, because they swim forward (progress again) and their scales are similar to small coins which means money. Cooked greens (spinach, collard/mustard greens, cabbage, kale, etc) when cooked look like folded money, which would mean money and prosperity. Long noodles equal a long life. So don’t cut them, eat them long! Peas, lentils, and beans all swell (or grow) when they cook and are likened to coins, which means good fortune and luck. Some traditions eat 12 grapes at midnight, one grape for every month of the year. If you get a bitter grape that could mean that particular month will be a tough one. There are also some foods that are considered to be unlucky if you eat them on New Year’s Day. Foods like Lobster are considered unlucky because they move backwards as they eat. Chicken and other fowl are considered unlucky because they scratch for their food. Who wants to scratch for their food for the year? Some examples of good recipes for New Year’s Day in addition to this dish are Slow Cooked Pork Roast, Sweet Potato Pie, Sweet Cornbread, Whole Wheat Spaghetti with Garlicky Bread Crumbs, and Baked Tilapia Packets. Anyway, a lot of these are cultural traditions and superstitions. But I figure who couldn’t use a little boost in their good luck in the New Year? Of course, if there’s food involved I don’t mind trying something new either! What are your New Year’s Eve/New Year’s Day traditions? First rinse all the dried peas and pick out any brown ones. Place in slow cooker with water and bullion. I like to heat my slow cooker as I’m prepping everything, so place the slow cooker on high. In a skillet, cook the bacon about halfway. Just till the color changes, but not till crispy. 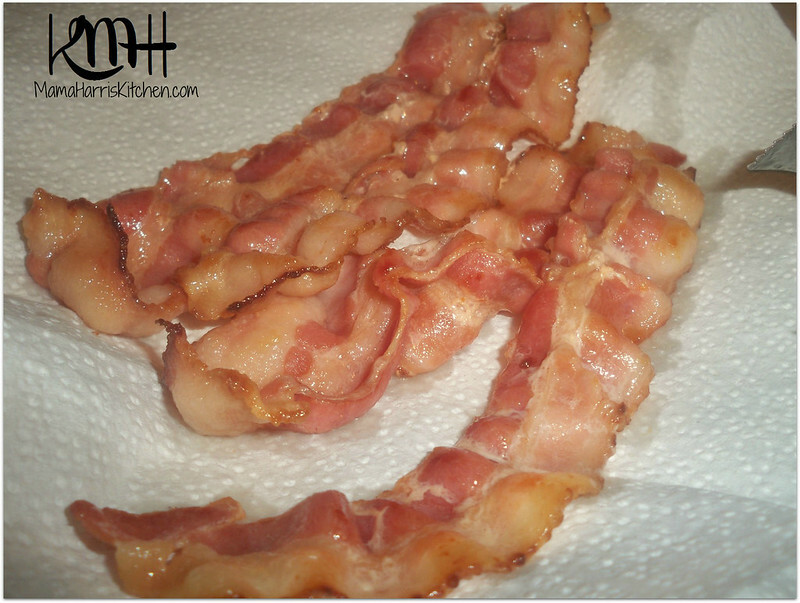 Reserve the bacon grease and place the bacon on a paper towel to cool. 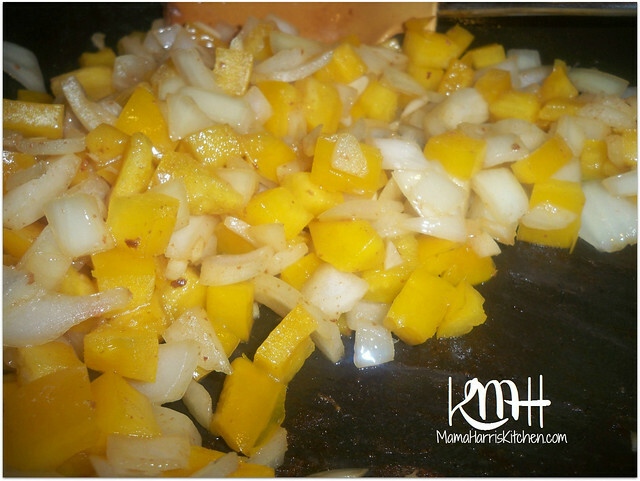 Saute the onion, garlic and bell pepper in the bacon grease until vegetable are soft. 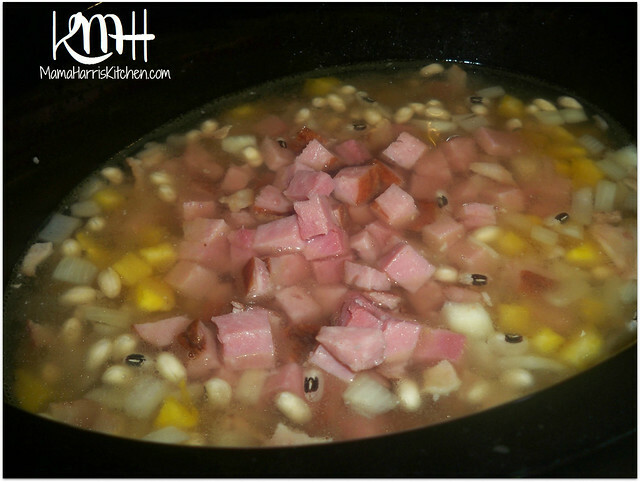 Break the bacon up into little pieces and stir into the slow cooker with the cooked veggies and cubed ham. Add the spices, honey, and jalapeño and the can of rotel. Cover and cook for 3 hours on high, then 2 hours on low. 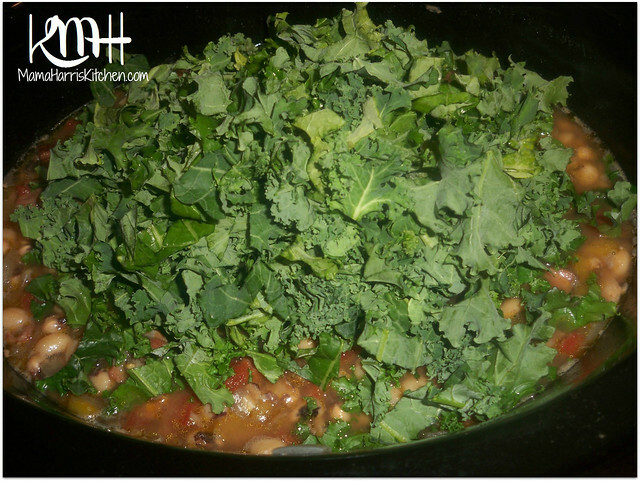 Stir in chopped greens, cover and cook on low an additional 30 minutes until greens are soft. The soup will be hot, so let stand a bit before serving. 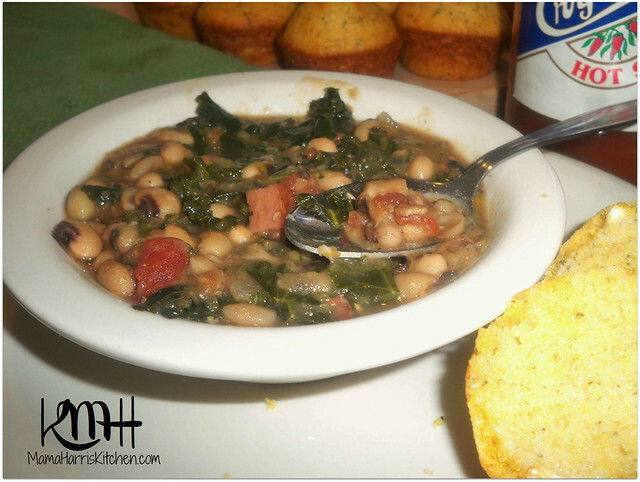 Serve with cornbread and a southern style hot sauce. What an awesome recipe I really enjoyed reading about the lucky foods. We are very superstitious! we ran out with our luggage so we could get lots of travel for the new year! 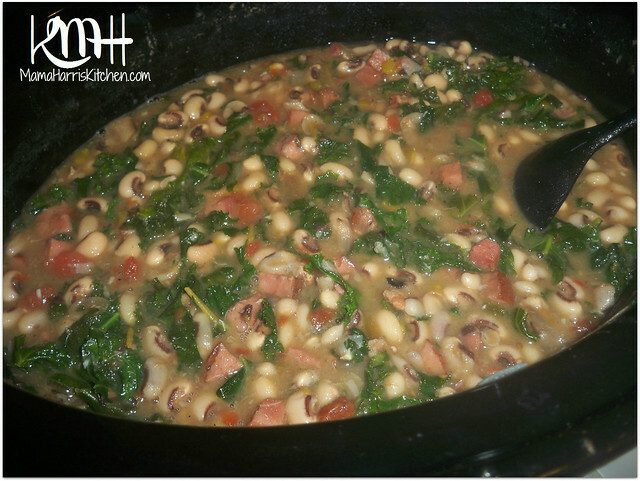 I’ve never had black eyed peas before – it looks great though!! Whenever I see such a fantastic detailed food post – I am just in awe. AMAZING POST!! Yummy! These look delish! 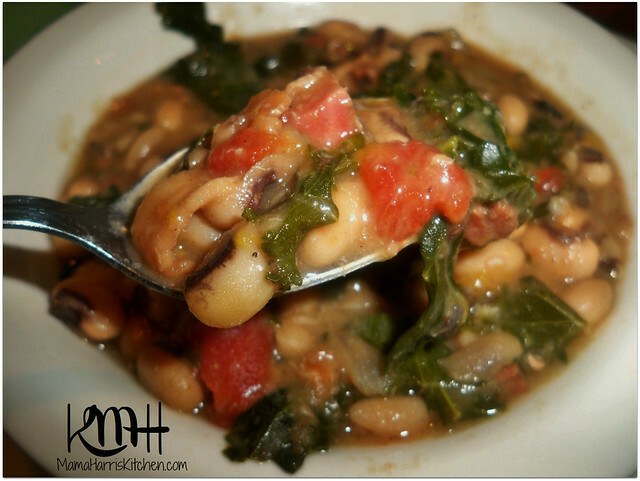 Thanks for stopping by and linking up to the GYB Hop! BTW, I made that coconut chicken tonight. I made it a little different than your recipe. I used curry powder in it. It was delish! This looks DELICIOUS! 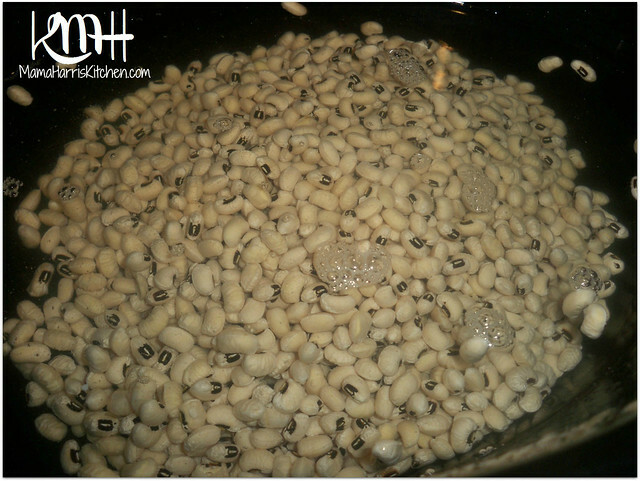 I have never had black eyed peas! Thanks for sharing on Foodie Friends Friday! Please come back on Sunday to VOTE!